Built on a natural granite base for optimum thermal and dynamic stability, the E-315FV is a mid-size option in a six-model range of centreless grinding machines designed for ultra-precision in-feed work. All six CNC axes of the E-315FV are driven by linear motors with position control courtesy of glass scales. With a long history of providing turnkey solutions and optimised machining processes for automotive components such as engine valves, shock absorber rods and steering racks, DANOBAT directs its design and manufacturing efforts to similar applications involving high volume production and stringent quality requirements. Equipped with a user-friendly Siemens Sinumerik CNC system, the E-315FV can accommodate workpieces from 0.5 mm up to 50 mm ground diameter, with a maximum in-feed grinding length of 200 mm. The largest of the five models can grind up to 250 mm diameter and 660 mm in-feed grinding length. Powered by a 20 kW electro-spindle, which means there is no mechanical transmission, the 610 mm (OD) x 200 mm (W) conventional (carborundum), diamond or CBN wheel of the E-315FV will progress smoothly from 20 to 120 m/s. The servomotor-driven regulator wheel runs from 10 to 150 rev/min, and the dressing wheel at 500 rev/min. 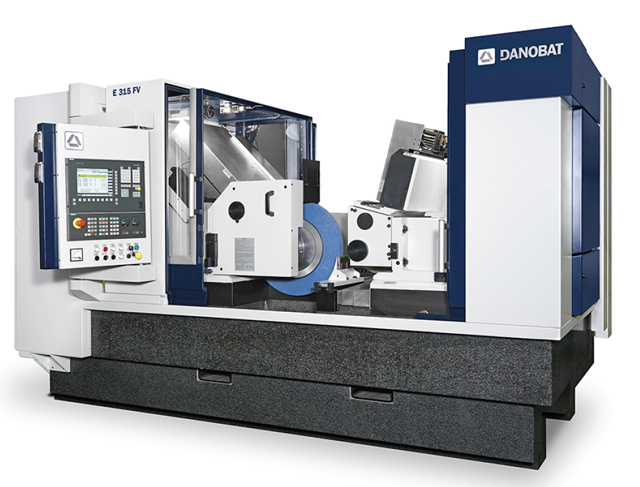 These DANOBAT centreless grinding machines can easily incorporate peripheral equipment such as load/unload systems, non-contact measuring equipment and coolant systems. This is particularly helpful in mass production applications, such as those typically to be found in the automotive industry.